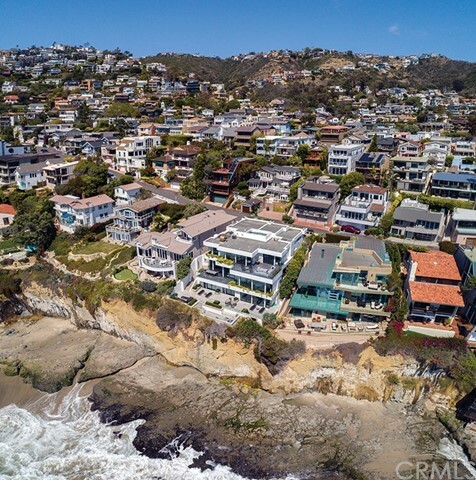 All Laguna Beach homes currently listed for sale in Laguna Beach as of 04/25/2019 are shown below. You can change the search criteria at any time by pressing the 'Change Search' button below. "Among the truly private beaches in Southern California, Irvine Cove is the most scenic and tranquil. 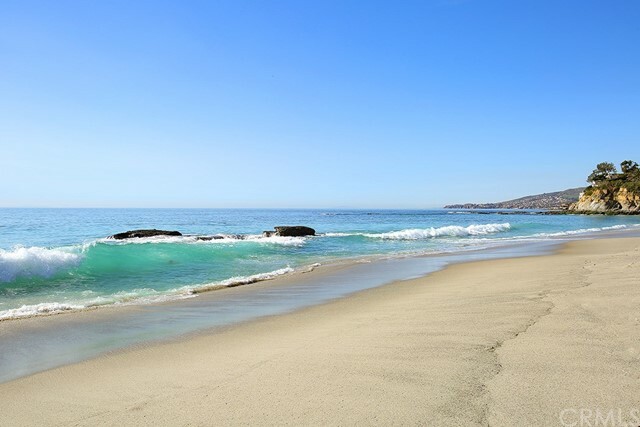 Situated in Laguna Beach, this idyllic cove has only five homes that open directly onto its sands. Villa Dei Tramonti is the largest and most private of these five. Situated behind its own gate, the property features 180 lineal feet of frontage on the cove and its own private steps to the sand. Surrounded by spacious terraces and mature gardens, this sublime Mediterranean Revival style residence exudes the ambiance of a private resort. Walls of glass enhance the striking views of the emerald waters seen from every major room. Nearly ten thousand square feet of interior space is arranged in a flowing plan of graciously scaled rooms. The great room alone is nearly one thousand square feet and features three seaward exposures. The warmth of the surroundings is reflected in the colors and materials selected for the home, which include honed limestone floors, artisanal bronze, and finely crafted millwork. Distinguished and urbane, the interiors are uniquely harmonious with the seaside locale. Being truly one-of-a-kind, this is an incomparable opportunity to live and entertain without compromise in a private beach setting." "The level of luxury is undeniably impressive,the location world-class. Standing atop a coastal bluff amid the resplendent beauty of the sun-soaked Laguna coastline, this private contemporary masterwork is a rare offering. With only 13 private home sites at the fabulous Montage Resort, this 9,500 sf custom estate commands coveted front row views of the Pacific Ocean and the surrounding natural beauty. Master craftsmanship and the highest quality materials are a consistent theme, delivering both comfort and opulent style. The generously proportioned spaces are richly detailed with Wenge wood, illuminated slabs of onyx, custom mosaic tile, natural stone, custom lighting, floating staircase, and gourmet kitchen with stainless steel accentuating exotic wood cabinetry.Walls of glass open to outdoor spaces while an expansive central skylight floods both levels with light. Extravagant lower level has full bar, glass-encased commercial wine cellar and outdoor lanai with spectacular one-story waterfall. Effortless livability is enjoyed with state-of-the-art technology systems. Owners have access to all Montage amenities: Spa Montage, Mosaic Pool, dining at the Loft and Studio. Personal services such as concierge, housekeeping and engineering support are available." "One of a Kind Masterpiece! Fabulous Antique Italian - French Country Ocean Front Estate Located on Almost One Acre with Approximately 180 Feet of Ocean Frontage. Panoramic Ocean, North Coast, City Lights, Catalina and Sunset Views Year-round. Simply the Finest Craftsmanship and Materials Available (Imported from Around the World) were used in this Virtually Brand New Home. Detached, Private, Guest House Suitable for your Most Sophisticated Guests. This Residence is Truly One of a Kind in Every Aspect. Surrounded by Tall Vine Covered Stone Fences, this Extremely Private Home has a Large Courtyard behind Rod Iron Privacy Gates that Welcomes you. Meander Through the Manicured Gardens with Imported Statuary, Historic Trees, Fountain, Outdoor Fireplace, all with an Ambiance Second to None. Indoor & Outdoor Living at it's Finest with Every Conceivable Amenity. Ocean Front Pool and Spa. Rambling Gardens with an Abundance of Private Patios and Seating Areas, All with Breathtaking Ocean Views. The List of Fabulous, Unique, Imported Features are Endless. Certainly, a Fantastic Residence for the Discerning Owner that Desires and Demands only the Finest. This Property will Make you Proud! Completely Remodeled in 2008"
"It is an incredibly rare moment when history, beauty, opulence and an oceanfront setting come together at one time, presenting an opportunity that is truly provocative. 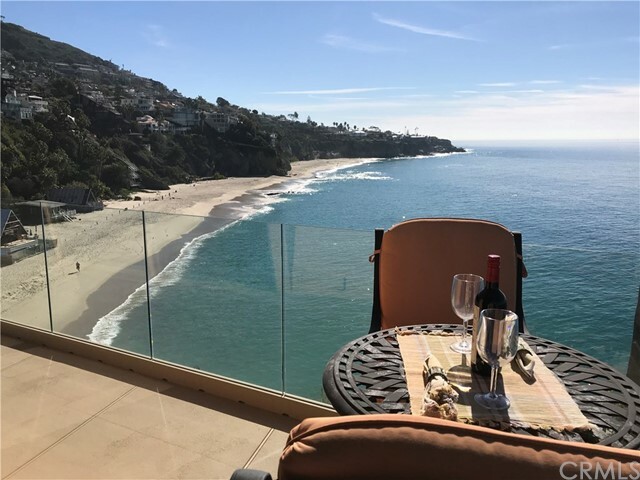 Crowning a dramatic bluff between Moss Point and Victoria Beach in Laguna Beach, Villa Rockledge encompasses nearly 25,000 square feet of seaside splendor, complete with stairs leading to a private cove. Created nearly 100 years ago, the tranquil oasis reveals panoramic ocean, whitewater and sunset views, exquisitely landscaped grounds, a main house and 4 guest villas. Enjoy 12 bedrooms, 11 baths, and gated parking for 12-plus cars. Exquisite attention to detail is evident in stained-glass windows, a cigar loft, carved wood doors, wrought iron accents, stone fireplaces, window seats, hardwood floors and crystal chandeliers. Listed on the National Register of Historic Places and showcased in a book about its creation and history, Villa Rockledge is Mills Act-approved, offering a significant tax break for maintaining the custom estate s appearance. While retaining its classic Mediterranean-inspired style, the property is professionally restored and upgraded with today s preferred appointments. Also known as Mariona Villa, the estate has a rich history enhanced by the allure of Old Hollywood. Actress Bette Davis met her third husband here in the mid-1940s, and Actor Erroll Flynn was known to visit. An enviable location is moments from restaurants, shops, galleries and resorts." "Situated on nearly 10,000 sq. ft. lot on prestigious Victoria Beach is this wonderful multi-family property with a main home, two additional units and tremendous possibilities. 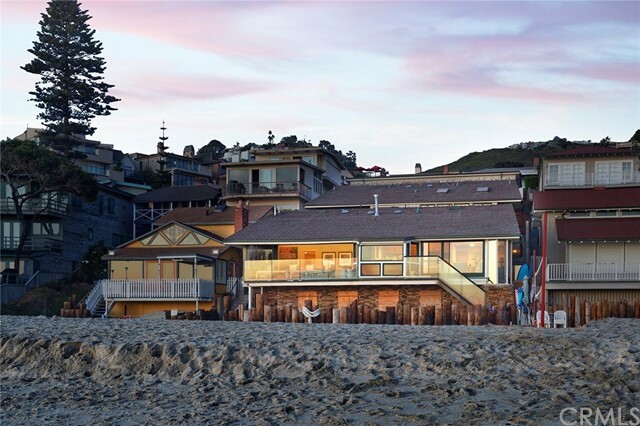 The Pacific Ocean and living spaces effortlessly blend in the four-bedroom, four-bath home, which is thoughtfully designed to take full advantage of ocean and Catalina Island views, sea breezes and waterfront amenities. Walls of windows and sliding glass doors open to beachfront patios, with spaces for comfortable gatherings, an open kitchen clad in warm woods that overlooks the dining area and great room, and a separate living area for entertaining. All baths are updated to include custom tilework, spa fixtures and luxury amenities. Two in-law, guest or rental units are elevated to optimize ocean views, and each includes two bedrooms, two baths, living areas, and kitchens, all impeccably updated. Hardwood floors, recessed lighting, skylights, raised ceilings, and multiple fireplaces are among the touches throughout that add to the comfortable and bright design. Close to Laguna Village and the renowned Montage Resort." "Situated on a private corner parcel at one of the world's most prestigious resorts, this beachside masterpiece affords the homeowner unbridled luxury in its many forms. Vast views of the Pacific abound from the nearly 8,000 SF open-concept residence inspired by Morris Skenderian and Danielian Architects. Slide-away stackable doors and an expansive wrap-around patio prove vital to the indoor-outdoor lifestyle experienced at the estate. An artful gourmet kitchen appeases the eye and the appetite alike with gleaming Mahogany cabinetry, three sinks, built-in espresso machine, and premium appliances; while, a central courtyard with water feature enhances the sense of ease that is felt within the methodically designed home. Three large en suite bedrooms, each with patio access, grace the main level. The utmost in comfort and convenience is found in the ocean-facing master suite fit with private fireplace and spa-bath featuring two distinctive sides, one with handsome dressing area and adjacent office, the other with walk-in closet, vanity area, and indulgent soaking tub. An elevator or staircase descent to the lower level unveils an additional guest en suite, wine cellar, and bonus or media room showcasing dramatic soffit lighting and swanky bar for overflow entertaining. In addition to a premier coastal location, residents of the estate benefit from access to the world-class amenities of the resort including personal concierge services, pool, wellness spa, and private dining." "Seen any SoCal oceanfront locations this grand, impressive and rare? Hovering above the wave break on its own promontory perch, Casa Sopra L'Onda lives on the edge of Laguna's most romantic beach. Amalfi cliffs and coves meet sweeping sands and aqua waters of Caribbean coasts, with lush majestic hillsides, Swiss funiculars, breathtaking bluffs, bold rock outcroppings, secret sand-bottom pools, and a bedrock tunnel navigable at low tide. Only Thousand Steps Beach offers such large scale and diverse natural beauty. Only this landmark point Property, with massive decks and over 80 feet of oceanfront, showcases all of it in such dramatic fashion. The unique position and oblique orientation provide totally unobstructed wraparound views - world class. A small intimate cove with large sea rocks and Catalina sunsets, and the magnificent Thousand Steps double cove - more textured terrain and dry sand than any coves around. From the street-side of the home you can see inside the tubes of waves breaking toward you. Cannot exist elsewhere. Cannot be duplicated. Seaward of neighboring homes, slightly slanted walls of reflective glass flood the interior with natural light while affording complete privacy in all directions. Privacy outside too. Ideal sun orientation: south facing with east and west exposures. Staff quarters, full floor master suite, center island kitchen, tree canopies, trellises, wine cellar area, and a romantic trompe l'oeil mural warming the courtyard for your arrival..."
"Spectacular oceanfront Laguna Beach home nestled above the bluffs of Wood s Cove. Warmth and sophistication are beautifully paired with extraordinary materials and sleek contemporary lines. Enjoy dramatic ocean and sunset views framed by floor-to-ceiling windows with sublime interior spaces spilling out onto spacious terraces to bring the outdoors in. The floor plan unfolds over two levels and includes an open concept living room with chef s kitchen and butler s pantry, formal dining room with ocean views, large media room with wet bar, wine storage and a top-of-the-line electronics system. There are four en-suite bedrooms including the master suite with office, private terrace, fireplace and a sizable bathroom overlooking the crystal blue ocean below. This lavishly appointed home includes controlled gated entry, Crestron whole-house system, exotic wood cabinetry, imported limestone floors, Weiland sliding doors, wood and glass interior doors, and electronic shades. The highly desirable location is an easy stroll by street or along sandy Main Beach to restaurants, galleries, shops and entertainment." "Emerald Bay Point front row. Currently the only Emerald Bay oceanfront available. Unobstructed ocean views looking south from all levels. Beautifully constructed and designed, this home is a gem. The main level features formal living room with an elevated formal dining area and library/office, as well as a wonderful morning room and fabulous kitchen. All enjoy the exquisite panorama. The upstairs master suite is spectacular, alone with its own private viewing deck. Downstairs is for fun...with gym, entertainment room, bar, and terrace featuring a wonderful ocean view spa. Feels like a Puerto Vallarta resort. Five bedrooms in all, four fireplaces, elevator, three garages, golf cart port and much more. Don't miss this one." "Welcome to one of the world s finest oceanfront estates, where a rare double bluff-top homesite of nearly 20,000 s.f. and a fully remodeled custom residence combine to create the most unique living environment in Laguna Beach. Premium northwest-facing views capture the ocean, beach, crashing waves, shimmering lights and Catalina from every room of the contemporary masterpiece in guard-gated Three Arch Bay. A dramatic promontory setting is secluded behind a custom entry gate and features a circular drive, park-like grounds and spacious courtyard. Wraparound view decks offer steps down to bedrock, where a private saltwater pool is replenished naturally with the tide. Neither the location which spans 150' at the water s edge or the pool would be granted permission by today s codes, making this a truly rare opportunity. Approx. 5,144 s.f. with 4 bedrooms, 5 full baths and 2 half baths, the open and airy residence showcases soaring ceilings, a seamless living and dining area, a home theater, an extensive glass-enclosed wine storage wall, and a sleek kitchen with enormous island and top-end appliances. Just inside the entry gate, a separate structure is ideal as a gym, studio or office." "Featured on the cover of the February 2017 issue of Architectural Digest, this one-of-a-kind, 1.25 acre, ocean view compound captures endless vistas of the coastline, ocean and islands not to mention spectacular sunsets from every vantage point. Nothing like this exists along the coastline of Orange County. Reached via a gated and private motor court, the main residence is a capacious and ethereal dwelling. Laid out on a single level, it opens to the expansive outside entertaining areas that surround it all reveling in the views. Light, spacious and perfectly detailed, this home is the embodiment of California living. The magnificent gardens lead to a secluded and private garden oasis, replete with a lap pool and pavilion. Carefully blended into the landscape, this is a private haven where one can read a book or host a hundred friends for a summertime poolside soir e. The separate guest house is comfortably appointed and features ocean + city views. Vision, passion, and refined study were combined into an alchemy here, the result of which is this sublime and understated retreat. It took more than a decade to complete this property, which will undoubtedly continue to provide an exceptional setting for all who have the pleasure of spending time here." "So many attributes of this oceanfront home are extraordinary; the sizable and extra wide parcel with a perfect position at the end of McKnight Drive; the uninterrupted cove, coastline and sunset views; the incredibly rare, single-story configuration; its impeccable condition after an extensive and just-completed renovation; and its highly preferred North Laguna Beach location. There is simply no other property on the market with such high marks in all categories. The spacious, light, and open plan is perfect for seaside living and entertaining as all of the main rooms open to a generous oceanfront terrace and incredible panorama. Filled with natural light and elegantly appointed, the palette of tan, cr me and gray complements the striking emerald and aqua waters of the ocean. Set dramatically atop the cliff reminiscent of the Cote d Azur, the views of the waves in the cove below and Emerald Bay are sensational. Recent improvements include a newly outfitted kitchen with Italian marble counters and select appliances, imported limestone floors, a sumptuous new marble-lined master bath, new fully retractable sliding doors along the oceanfront, and myriad designer appointments. Perfectly refitted and ready to move in, this is the home many buyers seek but never find in such a competitive and limited marketplace." 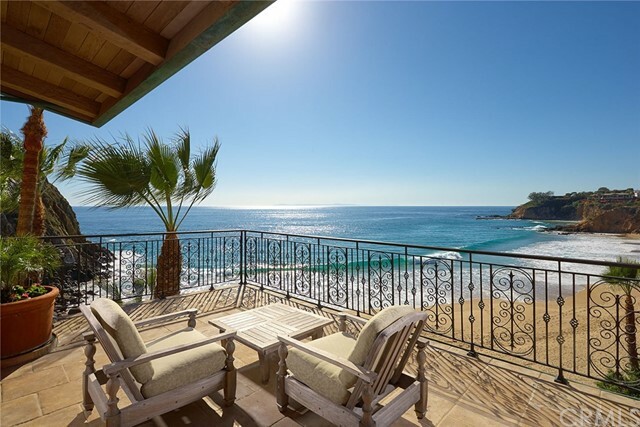 "Promising a lifestyle marked by modern elegance, this breathtaking oceanfront residence offers a coveted location in Lagunita, a gated community that s just a stone s throw from Laguna s famed Montage resort. Directly facing the pristine sands of Victoria Beach, one of the world s most spectacular and secluded beaches, the home offers a heightened level of privacy. It also showcases mesmerizing panoramic views stretching all the way to Catalina Island from each and every one of its living spaces. Spanning a spacious four bedrooms along with an office, the home also includes a massive bonus room featuring a bar, not to mention sit-down ocean views and a large deck with a hot tub and private stairs down to the sand, which make the entire residence feel seamlessly connected to the beach. Stunning walls of glass throughout the home work to pull the surrounding scenery inside, establishing an ambiance that s simply unforgettable. A lawn on the property s lower level, as well as three massive decks, overlook the beach and the ocean, providing an unrivaled setting in which to make memories with family and friends. Meanwhile, a spacious master suite replete with a spacious walk-in closet, an ocean-view gym, a large shower, a sauna, and a spa-caliber steam room offers a set of amenities rivaling those of any five-star resort. An elevator serving all floors, along with a cabana room close to the beach, adds an element of convenience to this exquisite home." "Seller says to SELL IT NOW!This amazing soft contemporary, premium coastal location, custom home is graced with mesmerizing ocean views from three magnificent levels. Spanning the three levels are 5 beds & 6 baths. Custom stonework & cabinetry, top of the line appliances, spectacular custom lighting, & custom window treatments. The entry level to the home highlights the master suite with ocean views all around, an adjacent office & 3 car garages. The main level living features an amazing kitchen with top of the line appliances including Gaggenau, Thermador, Wolf, Fisher & Paykel, Perlick & Sub-Zero appliances. This spacious room provides for multiple eating areas & an abundance of cabinetry/storage space. Also, on the main level are 2 bedrooms & 3 full baths, the dining and living rooms & a wine cellar. An amazing great room can be found on the lower level of the home that is perfect for entertaining large or small gatherings. The room features a spectacular bar/eating area that seats eight, with beverage/wine refrigeration, ice maker & dish drawers. The entire area is beautifully appointed with custom lightening, stone, & woodwork with expansive custom doors that allow the space to seamlessly flow beyond to the terrace & views of the ocean below. In addition, there are 2 more bedrooms/baths & a large laundry/utility room on this level. An elevator spans all 3 levels of the home. 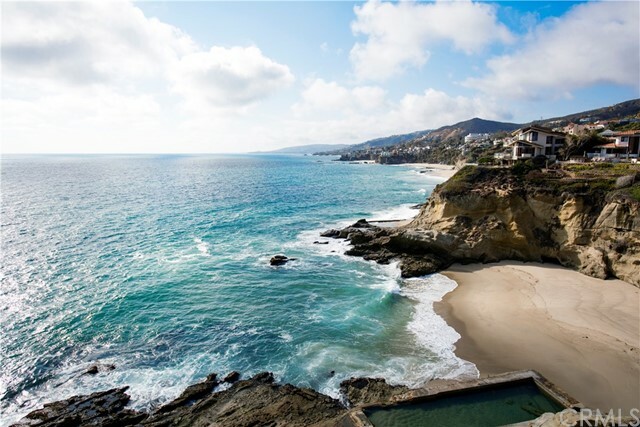 Enjoy the popular Laguna Beach village restaurants, night life & proximity to the Montage Hotel." "The ultimate Southern California lifestyle awaits at this modern masterpiece on the sand, where stunning design, high-end features and dramatic white-water views are found throughout the estate with an alluring split-level courtyard, pool, and spa at its core. 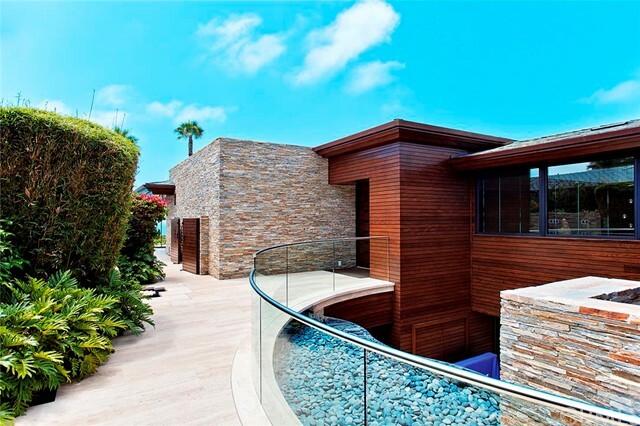 Reflecting the talents of architect Mark Singer, the contemporary oceanfront residence carefully blends crisp angles and sleek fixtures with natural Lompac stone walls, Spanish limestone and Pacific Ocean views at nearly every turn. Glide-away accordion doors open the main living area to a surfside deck with direct beach access and panoramic ocean, shoreline and sunset views. Soothing ocean breezes refresh the senses in a great room and kitchen area complete with a fireplace, large island with bar, custom Poggenpohl cabinetry and top-end appliances. Appx. 4,378 s.f., the 3-br, 4.5-ba design is served by an elevator and showcases a floating staircase, custom lighting, floor-to-ceiling windows, solar energy, and a state-of-the-art Savant smart-home automation system including iPad/phone interface. The resort-worthy master suite is appointed with a view deck, fireplace and bath with stand-alone tub, all of which enjoy a backdrop of sparkling seas. A media room with wide screen and surround sound, an office, 3-car garage, and 3 driveway spaces are additional highlights. Relax at home while surfers challenge the waves, or hit the town, where restaurants, galleries and shops are just outside your doorstep in Laguna s Village." 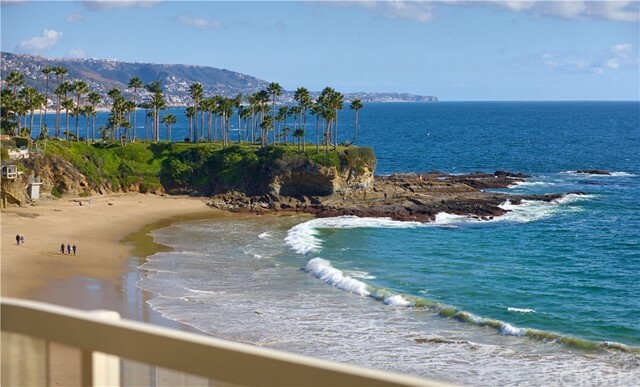 "Among the truly private beaches in Southern California, Irvine Cove is the most exclusive and scenic. This ranch-style estate is located in the community of Irvine Cove on the south side of Pacific Coast Highway, and includes an approved set of architectural plans from renown architect Christ Light for a 6,210 square foot contemporary residence. The current residence is one-level design encompassing 4,886+/- square feet, and nestled on an expansive lushly landscaped homesite spanning 22,320+/- square feet. 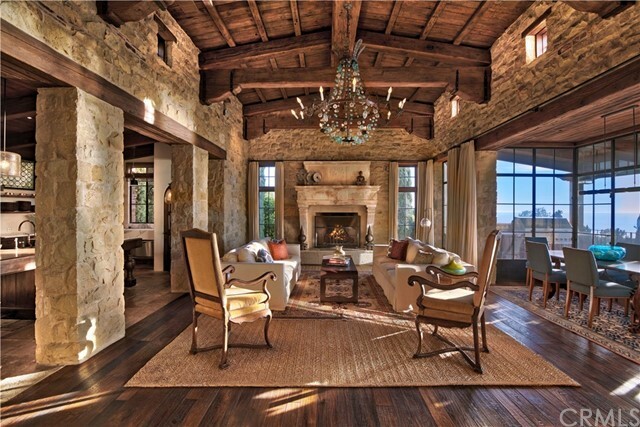 Vaulted, open-beam ceilings soar over a generously sized formal area with dining room, living room, and stone fireplace. Five bedrooms and six baths are showcased, including a spacious master suite with views of the ocean. Nearly every room of the home opens to the outdoors, with an abundance of private patios, a large sun terrace, a covered lanai, and an ocean-view courtyard with pool and spa, perfect for year round entertaining and large family gatherings. Live and entertain without compromise in a private beach setting, with 24/7 guard-gated and patrolled security, and access to the association park and tennis courts." "Located on the sand in the gated community of Lagunita, this mid-century modern masterpiece has recently undergone a complete restoration and modernization transforming this iconic home into a showcase. With 3,743 square feet of living space including detached guest quarters the home includes three bedrooms, four and one-half baths, family/media room, and home office. The attached two-car garage has an elevator that connects to the interior of the home. The open beamed ceiling in the kitchen is comprised of a semi-translucent material that provides a mesmerizing ambiance. The most proficient chef will savor the appliances including a Wolf 48 dual-fuel stove and Sub-Zero refrigerators and freezers. Quartz countertops, custom cabinetry, solid hardwood flooring, walk-in pantry, and center island all compliment this kitchen. The master suite features two full baths each with heated porcelain tile floors, heated towel racks, quartz counter tops and separate walk-in closets. There is also a fireplace and plenty of room for a home office, exercise studio or sitting room. Designed for comfortable living with an emphasis on quality and luxury but with a sensitivity to the environment, this spectacular home features the finest craftsmanship and materials along with 40 roof mounted solar panels. There are very few homes in all of Laguna Beach that are actually situated on the sand and even fewer that are located in a gated community. A must see home for the most discriminating buyer." "With its spectacular setting on an ocean view promontory of nearly one acre, this contemporary coastal estate was inspired by luxury five-star island resorts. Completed with impressive detail, this truly magnificent home encompasses approximately 10,200 square feet of living space. The serene tropical ambiance moves seamlessly to outdoor spaces with virtually every room offering panoramic ocean and canyon views. The open indoor/outdoor floor plan features grand living areas, chef-grade kitchen plus caterer's kitchen, professional recording studio, wine room, tasting room, dramatic high ceilings, and sculptural staircase of glass and Walnut. The entire home is showcased with custom designer details including light fixtures, imported European Oak, Walnut, and stone. Outdoor amenities including a custom saltwater pool with swim-up bar, 10-person spa, large entertaining cabana, and pool house with shower/steam room make this the ultimate entertaining compound. Balinese-inspired landscaping and a private gated entry and drive lead to the 10-car garage with a turn around to accommodate 8 additional vehicles. 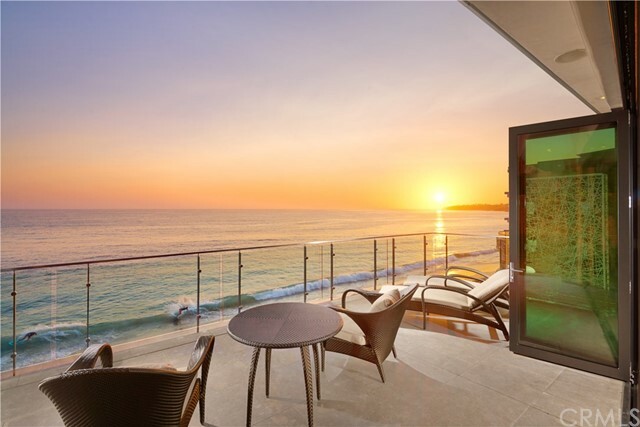 This is Laguna Beach luxury at its very best." "Perhaps the most perfect home in all of Laguna, this inspired Italianate villa commands spectacular views from its elevated and private position. Occupying one of the largest parcels in the town, it sits on the lee side of a picturesque ridge. From here, miles of coastline views fade into vistas across the ocean with Catalina Island and Palos Verdes guarding the horizon. Sunsets are truly magnificent. The house itself is a study in fine design and architectural achievement. The materials and execution exemplify refinement and artisanship only the most generous of budgets can create. Inside, intricate installations of stone, brick, and carved wood accent over-scaled rooms some with 14 ceilings. Antique mantels, imported fixtures, and steel + glass fenestration are but a few of its distinguishing features. Ultimately, the composition is one of warm and generous spaces that defer to the ocean views and half acre of enchanting gardens that envelope them. Outside, sun-drenched terraces are awash in the scents of the Mediterranean garden and sea breezes. A sparkling mosaic tiled pool, adjoining cabana, and outdoor dining room with fireplace are highlights of the garden. Set at the desirable edge of the village, the town and beaches are a short stroll away." "Prime oceanfront estate, set down a private driveway, on the front row of prestigious, guard-gated Three Arch Bay. A tranquil gated courtyard leads to 4,572 sq. ft. of spectacular living space to rejuvenate and entertain in. Four en-suite bedrooms all with large ocean-view terraces, additional guest room, study (optional 6th bed), 5 baths, and gym. The luxurious master suite, which features an elegant 300 sq. ft. walk-in closet, opens onto a beautifully landscaped seaside garden with an outdoor shower. 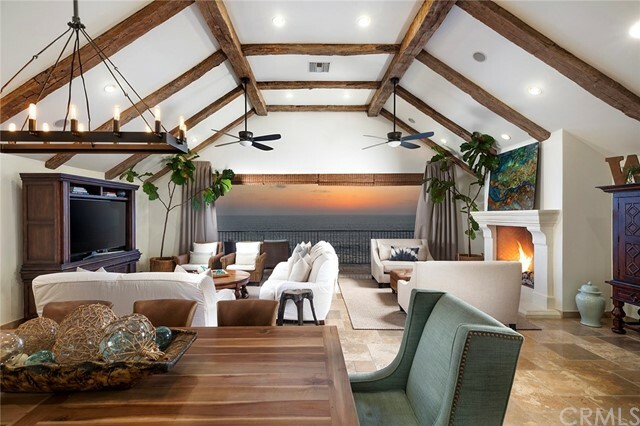 The great room showcases commanding views of the Pacific across walls of glass, a light filled vaulted ceiling, romantic fireplace, and a large oceanfront terrace. Modern amenities abound; from custom Mahogany doors to electric blinds & shades, from Lutron lighting throughout to white oak flooring. The open-concept kitchen boasts sleek Calacatta marble countertops and Sub Zero/Viking professional appliances. This architecturally enhanced property is positioned to capture coastline views of white water crashing on the sand from multiple social rooms, bedrooms, oceanfront terraces and garden. Parking for 6 cars on the driveway plus a 500 sq. ft. 2-car attached garage. Three Arch Bay offers a rare resident-only beach with fire rings, volleyball courts, bathrooms and picnic areas. The community also features tennis courts, playground, park and clubhouse. Close to the Montage, Ritz, Dana Point Harbor and John Wayne Airport. 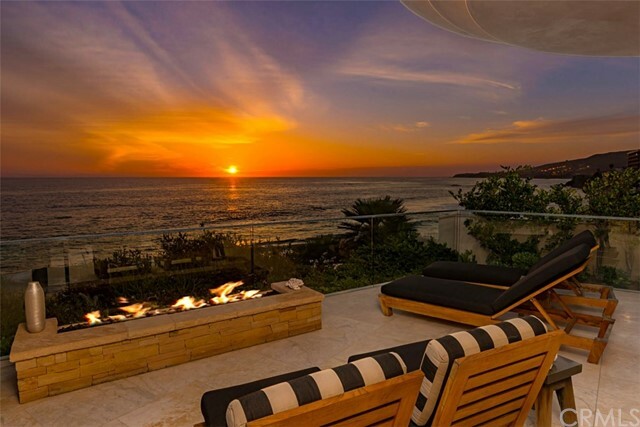 This is the ultimate in Laguna Beach oceanfront living." 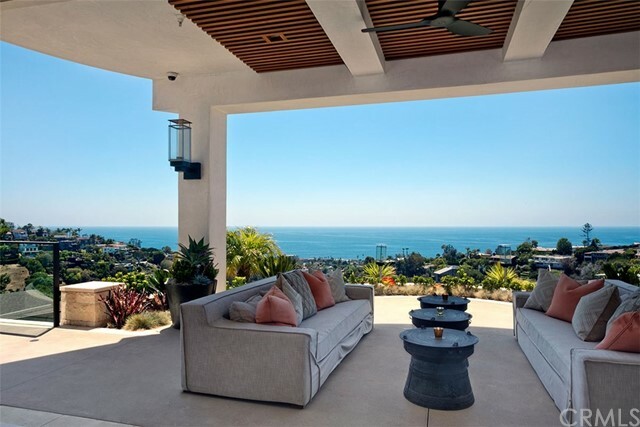 "Presenting some of the finest oceanfront views in Laguna Beach, this meticulously maintained residence designed by famed architect Chris Abel features private concrete stairs to the beach below, appx. 50' of frontage, and the soothing sound of crashing waves from within the preferred neighborhood of Crescent Bay. 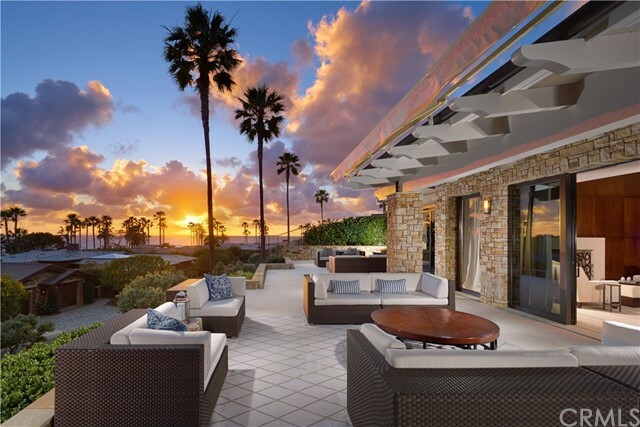 Captivating vistas of the beach, Twin Points, Two Rock Point, Dana Point, and colorful skies from a setting sun are enjoyed from all 3 levels of the home, which encompasses 3 ensuite bedrooms, 4.5 baths, an elevator, and approx. 5,263 sq. ft. A spacious deck and large mahogany-framed picture windows complement awe-inspiring views on the main level, where a fireplace-warmed living room and formal dining room are enriched with gleaming wood flooring and open-beam ceilings. Freshly updated, a custom kitchen displays refinished cabinetry, new quartzite countertops and a stylish new backsplash. Upstairs, another deck complements a luxurious ocean view master suite with fireplace, office nook, and an elegant bath with dual vanities and large shower. The ground level reveals a second family room or bonus room, patio with built-in BBQ, gym and two secondary bedroom suites, one of which looks out over the sea. A 3-car garage and 3 uncovered spaces in the driveway provide plenty of parking, while the home s convenient location affords enjoyment of Crescent Bay Point Park, relaxing on the beach below, or exploring the galleries, restaurants and boutiques of Main Beach." "The natural beauty of the coast surrounds and blends with the finest modern amenities in this luxurious custom residence. 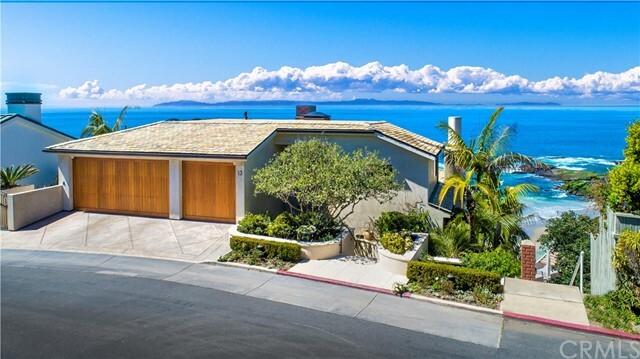 Situated on one of the best oceanfront lots in prestigious, guard-gated Three Arch Bay, this home boasts approximately 5,400 square feet of living space, which could not be replicated today. Attentive details throughout exude a sense of comfortable ease, from imported stone and wood to the three oceanfront decks, providing the ideal setting for exceptional living and entertaining. Framed by beautiful ocean views, the contemporary gourmet kitchen features marble counters, custom cabinetry, and professional-grade appliances, opening to whitewashed walls contrasted with exposed beam ceilings of reclaimed oak seated high above the main dining and living area. The master suite features a private deck overlooking the cove below, custom fireplace, separate shower, therapeutic tub, and secondary makeup vanity. This coveted coastal estate s prime location affords incomparable panoramic views overlooking the beach cove, waves ebbing and flowing on the sand, iconic arches, and Catalina Island out in the sparkling Pacific Ocean. A world-class oceanfront enclave, Three Arch Bay offers numerous amenities including the famed private beach with fire pits, picnic areas, volleyball courts, tennis courts, a basketball court, playground, park, and clubhouse. 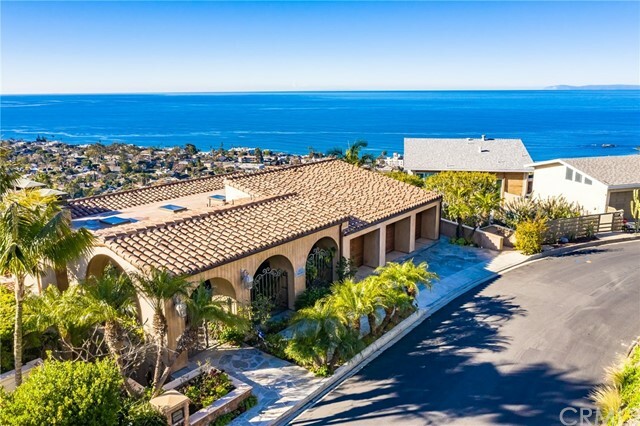 Live the Laguna lifestyle, enjoying epic sunsets and cool ocean breezes in this luxurious coastal estate." "When the late, great Laguna Beach architect Mark Singer studied this site in coveted lower Mystic Hills, he knew that it would provide the perfect backdrop to showcase the carefully curated collection of art and antiquities belonging to the family that would call this special place home. Upon entering the imposing glass and hand-forged metal front door, visitors are greeted by a formal foyer with a cascading staircase leading to a grand, open formal living and dining room that showcases views of the Pacific Ocean, Catalina, Main Beach and iconic Laguna Beach landmarks from walls of floor-to-ceiling glass. Baccarat chandeliers and sconces provide twinkling light to beautifully illuminate the museum-quality finishes. Walking through the main living area, you reach the oversized chef s kitchen, complete with the world s finest appliances, and perfectly suited to entertain family and friends with its large patio overlooking the Pacific. Slabs of limestone adorn each step down to the 4 bedrooms, each with its own spa-like bathroom. The marble-clad master bathroom features an oversized steam shower, spa tub, dry sauna, expansive counters and sink areas, and a giant walk-in closet with custom cabinetry. A spectacular library, office and den complete the opulent master bedroom wing. The resort-like pool, spa and oversized outdoor fireplace offer an ideal space for you to unwind while enjoying the expansive views. A 3-car garage and 4 spaces in the driveway offer abundant parking." 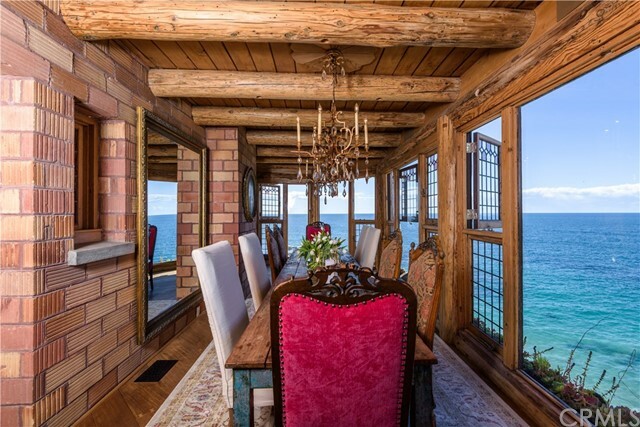 "Situated on the Smithcliffs bluff in North Laguna Beach, Maison De Cap overlooks glistening Emerald Bay. Panoramic ocean views await as you enter this tranquil estate. Besides the 7,212 sq. ft. and multi-levels of living space, the property also boasts 3,238 sq. ft. of decks and patios - perfectly blending indoor/outdoor living. Enjoy views of the Torrey Pines and ocean views from the main living area, formal dining, gourmet kitchen and morning room on the third level. The top level has a deck with wet bar, bath, covered dining area, fireplace, barbecue and spa. Level two consists of four suites with private bath, media room/office and 900 bottle wine room. Level one has parking for 11 cars and additional studio/office with bath and kitchenette. All levels are accessible through the elevator, interior or exterior stairs. The sophisticated color palette throughout the home is designed to help you relax and rejuvenate mind, body and soul."